By taking a different approach when it comes to fit and lowering the price, the Jabra Sport Pace might be the company's best offering yet. If you're looking for a cheaper alternative to the Beats Powerbeats2, these are your best bet. Announced earlier this year, the Jabra Sport Pace were finally released earlier this month. While we haven’t reviewed every product Jabra releases, we liked both the Rox and Sport Pulse, so we were looking forward to seeing what a lower-priced product from the company might look like. Similar to the Sport Coach, the Sport Pace Wireless don’t feature the heart rate tracking of the Sport Pulse, but they still integrate with the company’s Sport Life app. Unlike the other products we’ve seen from the company, the Sport Pace Wireless use over-ear hooks instead of in-ear wings. It all sounds good, but did the company trade sound quality for a lower price? Fortunately, the answer is no. You’ll spot the headphones as soon as you open the box, and the manual is located underneath. An inner box sits beside the cardboard holding the headphones, and inside you’ll find two additional pairs of ear gels, and a micro USB charging cable. The Jabra Sport Pace Wireless are available in three different colors. We’re looking at them in blue, but they’re also available in red and yellow. No matter which color you pick, the cord is reflective in order to keep runners more visible at night. You might notice that these look familiar, and they do bear somewhat of a resemblance to the Beats Powerbeats 2, thanks to the over-ear hooks. Whether these are for you or not depends, but I find them more comfortable than the in-ear wings used in many other headphones, including some by Jabra. The Sport Pace Wireless are very light at 22 grams, and as long as you get a decent fit with the three included sets of ear gels, they’ll start to feel like they’re not there after a while. This happened to me during testing, since even the most comfortable in-ears always remind me that they’re there. These are built with runners and working out in mind, and as a result they’re IP54 rated sweat and rain resistant, and they’re resistant to particles as well. In case anything goes wrong, Jabra offers a one-year warranty. Unlike some other in-ears released this year, the Sport Pace Wireless use Bluetooth version 4.1. While this isn’t the latest version of the technology (that would be 4.2), it’s a good deal newer than the version 2.0 + EDR used by many competitors. Pairing is very simple, with a friendly British-sounding voice providing instructions on how to pair with the device of your choosing. Range is the Bluetooth-standard 33 feet, though in most cases you won’t need to use this much range anyway. Looking at the controls, you have the standard mic and remote, which will end up sitting behind your right ear. At first it’s difficult to reach, but I found I got used to it quickly enough. You’ve got a multifunction button as well as + and – buttons which control volume with a tap and skip forward and backward when held down for a short time. One more button located on the right side interacts with Jabra’s Sport Life app. This app not only helps you plan and track workouts and other fitness information, but shows you how much battery life the headphones have left and even gives you tips on how to fit the Sport Pace Wireless properly. Like other Jabra in-ears we’ve reviewed, the Sport Pace Wireless are limited to roughly 5 hours of playback or talk time. Fortunately, it isn’t as much of an issue here thanks to the Rapid Charge technology which will give you an hour of play time on a 15-minute charge. I used this multiple times during testing and it always worked as expected, even when plugging into a laptop. While the Sport Life app prefers that you listen either with iTunes or Jabra’s own app, for our testing we used Spotify with the streaming quality set to “Extreme.” While the Jabra app provides additional audio options, we didn’t use this during testing. Given the way the Sport Pace Wireless fit, the lows are surprisingly powerful. There is a somewhat slow quality to the bass response, but these still do a fine job with metal and other similarly aggressive music. As an example, the kick and bass on Cancer Bats’ “R.A.T.S.” have plenty of impact without dissolving into a muddy pool of sludge. There is a heavy low mid presence to the Sport Pace Wireless. This often comes across are booming and can be irritating, but here it works. Russian Circles’ “New Macabre” makes good use of this with the guitars and bass playing off one another but leaving plenty of room for each other. As is the case with nearly all modern in-ears, the highs are rolled off to prevent harshness and, presumably, damage to your hearing. Still, detail is fairly nice. The electronic percussion and various synth trills in Trans Am’s “Monica’s Story” show this balance nicely, avoiding becoming irritating without fading into the background. Soundstage is fairly wide, surprisingly so for in-ears in this price range, with good stereo separation and spatial cues. One key difference between these and the Beats Powerbeats 2 is that these attempt to keep sound out — and do a fairly good job of it — while the Powerbeats 2 are meant to allow outside sound in. Neither is objectively better, but if you’ll be wearing the Sport Pace Wireless around the office in addition to at the gym, the noise isolation will probably come in handy. While we have our fair share of issues with Beats products, we’ve always enthusiastically recommended the company’s Powerbeats 2, mainly due to the fit. Now Jabra has presented its own take on the same style, only with better fitness features and a lower price point. The over-ear fit isn’t for everyone, but we can’t find many negatives about these, considering the price. Even the low-ish battery life is made up for by the Rapid Charge feature. 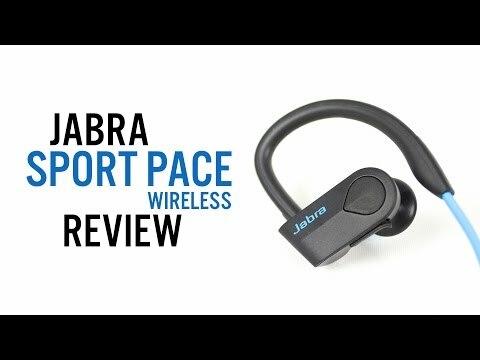 This combined with the comfort, sound quality, and $99 price tag make the Jabra Sport Pace Wireless an easy recommendation for anyone who is a fan of this style.